Christianity promises salvation from something called sin and sin's consequences: eternal damnation. Christianity promises this salvation is paid for in full by the crucifixion of an ancient Jewish, 30-something-year-old, itinerant preacher who, come to find out, was the direct offspring of Yahweh, the ancient tribal god of the Jews. Christianity maintains there is nothing anyone can do to earn this salvation. It is a free gift. It cannot be bought. It cannot be earned. It cannot be acquired by any actions on our part. It is freely given gift, again, paid for by the tortured death of Yahweh's offspring. The only way to receive this free gift that cannot be purchased or bartered for is to say out loud Jesus is Lord and sincerely believe he was raised from the dead. Saying Jesus is lord and believing in your heart isn't actively doing something, it's just a sort of little thing that indicates you've accepted the free gift (which also isn't doing anything) or something. It's not exactly a requirement for salvation -- it just shows you are already saved. I guess. Oh, and repent and be baptized. You also have to repent and be baptized. Repenting and being baptized also isn't really like doing something, it's just something you do to uh, uh... hmm. Also! Go to church every Sunday. And, give money. Let's not forget witnessing, reading the Bible, having regular family devotionals, voting Republican and participating in every church activity. Remember, however, that none of these requirements contradict the fact that there is nothing you can do to earn eternal salvation. In fact, performing all the requirements don't earn you anything, but none-the-less are still requirements. All these activities just help show that you really are saved. 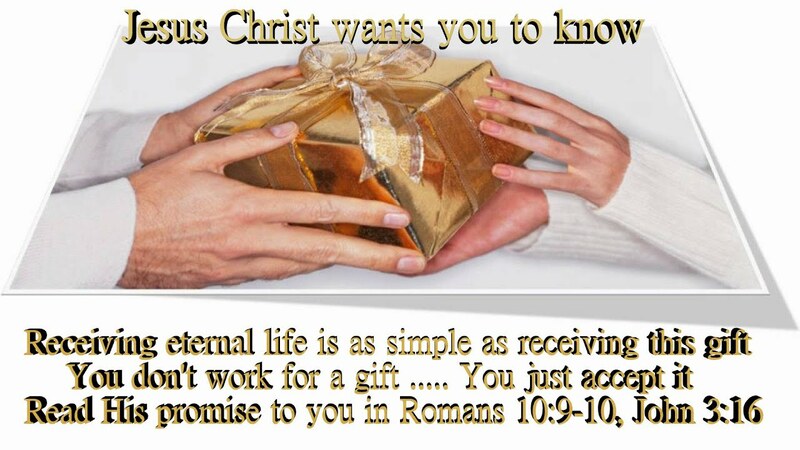 If you don't do these things, then you undoubtedly haven't really received the free gift of eternal life. So, only one thing left to do. Make sure you accept the correct version of Christianity, because if you don't find the real deal, you're screwed. Like for instance, ancient Arminians and Gnostics will be joining modern Jehovah Witnesses and Mormons in hell. There is also severe doubt about the eternal security of Catholics (if you're Protestant) and Protestants (if you're Catholic.) Baptists would maintain they have the real, correct version and so would most of the other 33,000 competing Christian denominations out there. Just remember, it's all a free gift and there is nothing you can do to earn or acquire this gift. But you better get it right, or your are totally fucked. I mean, totally. Forever like. I'm sure glad God gave us this free gift, aren't you?